December has been a busy month for the Team, not only working hard on completing orders for dispatch, but, also, working their way through the amount of chocolate and cake received. We are very lucky to have such a good neighbourhood around our Factory and we try and help several of our older neighbours where possible. Our neighbours kindly pop in at Christmas time with festive treats for the Team. 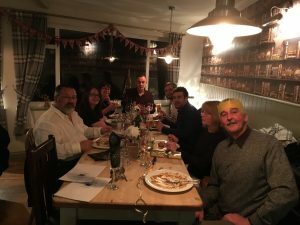 Saturday 9 December, was the Company’s Christmas Dinner, and this year we headed to The Blacksmith Arms in Calbourne. 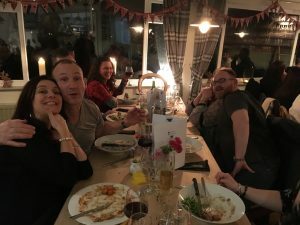 It is always good to see everyone dressed up and letting their hair down! We have been busy sending out our promotional gifts and as we all know Customers are imperative for all businesses to thrive and succeed and it is not only the sale that is important but the provision of service offered before and after. The team at Ceramic Substrates would like to take this opportunity to wish you all a Merry Christmas and a Happy and Prosperous New year and thank all our customers for their support throughout the year. 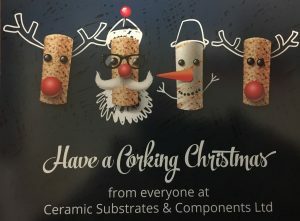 The Festive Season is the only time of the year that Ceramic Substrates shut down which is an old tradition for many a Manufacturing Company within the UK. We shall be closed from 22 December 2017 until Tuesday 2 January 2018.